Notes: Carrigaphooca Castle, meaning Castle on the Rock of the Fairy; the word Púca translates as kind of ghost or fairy) is a ruined five storey rectangular tower house, situated on a steep-sided rock, located 6 km west of Macroom, County Cork, Ireland. 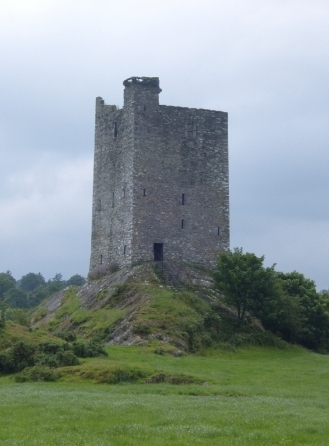 Although named as a castle, the Carrigaphooca was built as a defensive tower in 1436, probably by Donal McCarthy of Drishane. In 1602, the castle was attacked and taken by Donal Cam O'Sullivan Beare. During the 1970s, the Office of Public Works undertook restoration of the site, and added a flight of steps leading over the rock base, joining with the main entrance. The ground floor chamber is lit by small off-center windows, and is flanked by a straight mural stairs which rises as a spiral to the 4th floor level. In an area rich with neolithic monuments, a stone circle lies two fields to the east of the tower.